This RSS trick isn’t much of a trick at all. In fact it’s a function that’s built right into WordPress, but one that very few know of. We’ve all come across a post that has a long (and I mean LONG) list of comments associated with it. Keeping track of these comments can be hard for the author, let alone the readers. 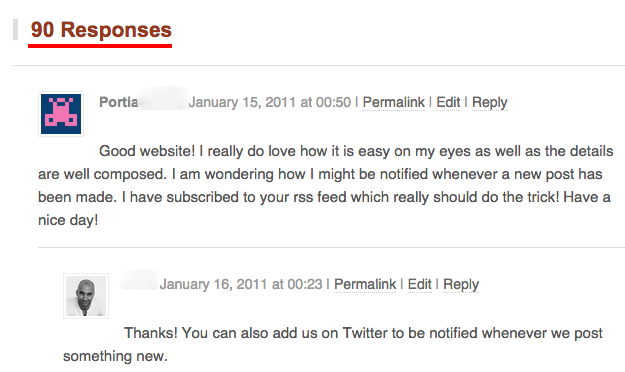 This is why WordPress offers the following function to provide an RSS feed specifically for the comments of a particular post. Calling this line of code will simply call the post_comments_feed_link() function that provides an RSS feed for the comments of a specific post, making it easier for your readers to keep track of those many, many comments.